If you ever see a magician on a boardwalk in the summer or doing a show, sometimes it’s fun to stop what you’re doing and watch for a minute. 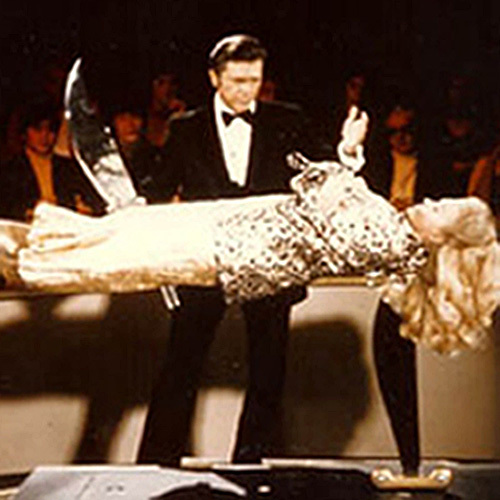 Most magicians who know what their doing have a way of surprising you with their long practiced talent. While all of their tricks have an explanation behind them, why can’t we pick it up right away or at all? This magician above uses tactics that play with our mind. When she puts a main focus on something, we put all of our attention on it as well. This is a trick to make us distracted and with the hand she isn’t using, she can preform the “magic” with. In this video in particular, she puts ideas into the viewers minds to make it seem like she’s just being funny when really its her plot to strike with another move. Why are people so inept to believe the whole card trick thing? If we “see it” we “believe it” most of the time. Vision is our most reliable sense according to this article. Based on what we see and the things the magicians say to us, we have a very good chance of being tricked. This Cris Angel “levitation” trick fooled many. Cris explains in the article that he is stepping up out of the shell of his shoe and making it look like both feet are off the ground although one leg looks invisible. He also uses simple props. Audiences need to be kept behind him for the trick to look very real. Kind of hard to explain but long story short, it isn’t more than just a little illusion. The graphic from this site shows horizontal levitation in which it appears she has no support. Everyones main fixation is on the woman floating so no one is really paying attention to the magician. Since the magician doesn’t move, you probably can’t tell that one of his “legs” is really a support pole for her to keep up. While magic is so hard to explain and tricks us constantly, we can only hope that one day we’ll be able to catch a magician in the act. I love watching magic tricks and just being blown away by the fact that I actually cannot think of a single possibility as to what in the world they are doing. Sometimes I actually get so freaked out that I can’t wrap my head around the action that I am scared for like hours after a trick. When it comes to magic, I am completely dumbfounded. However, I guess you could say at several points in my life I have believed in magic because the tricks being performed just did not seem possible. Even though you gave great examples in your post I could not find the hypothesis you were trying to prove. I think you could have gone in a direction of how magic, or illusion, affects our brains. Magic is all about the magician making the audience’s brain and eye confused about what each other sees or believe they see. While doing research on this topic I found out that perceiving magic has very little to actually do with your eye but more on how your brain interprets what you see. Even though illusions can be very difficult to understand, they can be studied to offer new information on how to brain works. To find out more on how you can be a better illusion finder check out, http://abcnews.go.com/Health/EyeHealth/optical-illusions-eye-brain-agree/story?id=8455573. This post was very interesting because I always used to watch Criss Angel and always wondered how he did everything! I guess I never took the time to look into how magicians perform their magic, so I always just believed it! After reading your article on Criss Angel and his levitation trick, I was shocked! I have seen that before and always thought it was some type of supernatural trick! Thanks for sharing. Now I know to pay very close attention to the things that magicians don’t want us to pay attention to. This post also reminded me of the movie “Now You See Me.” It is about magicians and I think you would really like it if you haven’t already seen it.